o one living has met The Judge  if there is one. Maybe some saw the light but got pulled back, but no one living can tell you what it's like to get to the light. Folksinger Dave Carter came close and, after reviving for a moment on his deathbed, said something like "I just died, baby" to his wife Tracy. The Spare Room (4830 N.E. 42nd Ave.): unique among Portland spots. We spend so much time concerned with how others judge us, and it sure is nice when judged favorably, but in the spiritual world we've created we know true judgment doesn't come until we die. Is playing blues-rock for four aging couples on the dance floor at the awesome Spare Room (no, not the Space Room on Hawthorne) the stuff of a favorable verdict? A night when you go home with your collar pointing heavenward instead of toward your feet? My wife and I were reminded recently about the fact that Barfly (one of Portland's best publications) is a monthly, meaning you may or may not have the most recent issue, and it may or may not have been updated since a bar made a change. Hence our sadness while checking out the Spare Room and finding '70s-'80s crooner Randy Burt (or some such) missing in action. Aaron Black Band: Put the band in tailored suits  even just collared shirts and slacks  and give the people a sense of occasion. That's to say that the action we see is courtesy of the Aaron Black Band instead, a father-and-son outfit I had actually heard of. I'd thought they were a higher-profile group, drawing throngs of people to clubs of more renown than the Spare Room. But I keep forgetting it's still January, and Tuesday night to boot, when the band is playing its standing gig from 8-11 p.m. 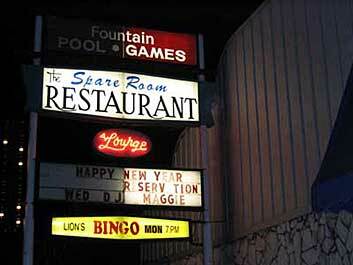 The Spare Room is unique among Portland spots: half 1201 Club circa 1995, half Shawdon's. It's a bar that would fit well in Montana. Check the scene: large room, dirty checkerboard tile, blue Naugahyde booths, low-slung ceiling, twinkling stars on the horizon (Christmas lights behind cork-board), two dance floors and three bars! One of the bars actually fronts the bandstand, but you can sit there having a drink one foot from the knees of the band's patriarch, Johnny Black! How cool is that? 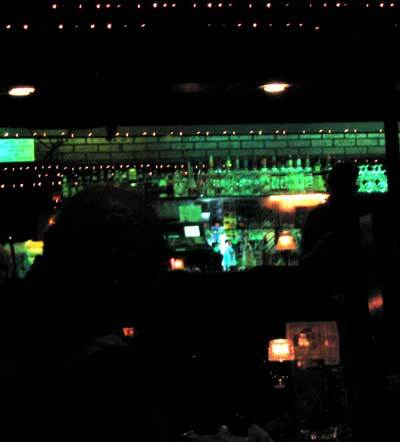 The club emits literal and figurative dim light through its eerie greenish bar, fast service and mysterious nether regions, plus free dance lessons on Thursdays and Sundays. Accoutrements aside, we can see blues-rock at nearly every other bar in P-town, so we're a bit down. Even with three pints (one Mirror Pond, two Budweisers ... I know) and some jalapeño poppers for $10.95; even with all this, we're a bit down. Not to say that we don't like blues-rock. Lord knows you readers have gotten your fill of my take on the blues-rock scene, and the Aaron Black Band indeed does a really good blues-rock. 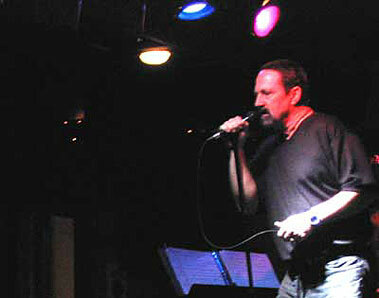 In fact, the small group tonight is really into the band, as rabid as a mostly over-50 crowd can be. And things may have gotten even more frenzied; we don't know because we scurried home after the first set. Nevertheless, before we leave we see Johnny Black attack the mic with showmanship and energy: gruff voice and looking like he just got off a day as foreman. Don the drummer plays with Stuart Copeland flourishes  skipping hi-hat and ride cymbals and a trick with the china-hat (or was it a splash?) that makes Sarah and I clutch at our chests. Jimmy on the bass cruises to speed as well, with tight, solid grooves; an Intel refugee with a five-string, perhaps? You know what blues-rock is really about, though, don't you? Eerie green light: fast service and mysterious nether regions, plus free dance lessons on Thursdays and Sundays. So how good a guitarist is Aaron Black, anyway? We get our money's worth with solos every song, as expected. His rhythm is unassailable if not too remarkable, and his leads are quite tasty for the average fan. But what stands out? A solo with 16, maybe 32 beats of one quavering, odd interval note for instance, along with other idiosyncratic, odd-notion genetic-stamps  but never enough. We like the parts that say: "Judge me not because of how I measure up, but for the way in which I am different." That said, the laid-back look has got to go. Put the band in tailored suits, even just collared shirts and slacks, and give the people a sense of occasion. Because it is, after all, a show. It is blues-rock. For the Aaron Black Band there is the potential to rise. And, at least for the time being, we're all our own jury and judge.